The Symphony No. 41 in C major ("Jupiter"), K. 551 is a work for orchestra. 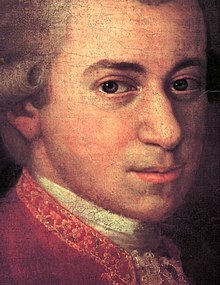 It was written by Wolfgang Amadeus Mozart in 1788. It is his last symphony. Michael Rodman writes in the All Music Guide to Classical Music that the first movement is "characterized in part by the dramatic and effective employment of unexpected pauses in the rhythmic flow through the use of rests, [and that] irregular and changing phrase length contribute ... to the dramatic impetus." He writes that the serene F major second movement is disrupted by "minor key episodes ... [and that] this light/dark conflict continues throughout". He points out that the gracefulness of the Minuet can be attributed to the flowing, even accompaniment and the "falling chromatic theme". The trio has an "earthier, more overtly dancelike mood", he writes, but is "interrupted by a suddenly more serious" outburst from the full orchestra. The contrapuntal fourth movement is filled with "great tension and dramatic impulse" that is resolved only in the final bars. Woodstra, Chris, et. al. 2005. All Music Guide to Classical Music. All Media Guide, LLC. p. 895. ISBN 0-87930-865-6.